The R/V Hogarth supports local coastal research and education needs and can stay offshore up to 8 days. JACKSONVILLE, Fla - Marine science students from UNF toured a research vessel that could further their careers in ocean science. Thursday the R/V W.T. 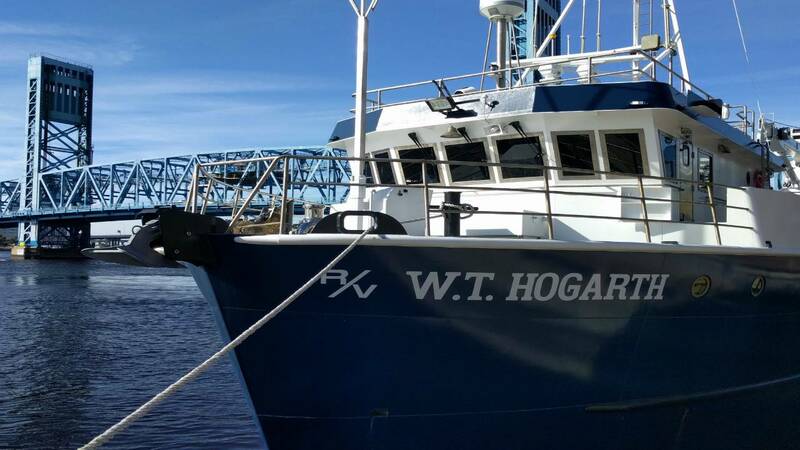 Hogarth docked on the St. Johns River in downtown Jacksonville showcasing the latest research tools on a vessel recently christened in May 2017. The 78-foot floating lab is run by the Florida Institute of Oceanography for use by all the universities across the state along with private and NGO scientific organizations. The ship is on a state tour this month following recent buoy deployment and shark research in the Gulf. This summer, the ship will take marine biology students from JU and UNF offshore to gather data in a field studies class. The students will learn how to operate state of the art tools like water quality sampling CTD and Fisheries Eco-Sounders. Over the years students have contributed to specimen surveys during the popular summer classes while getting hands on experience deploying plankton trawls and otter trawl nets.